~What an exciting time in spinning class. This semester we are going to focus on different types of wools as well as learning different spinning techniques and some dyeing. Yesterday we looked at Lovely Lincoln Locks. What a very curly crimpy wool and so very soft. 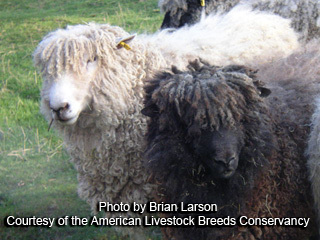 Lincoln sheep originated in Lincolnshire, England where they are called Lincoln Longwool. World-wide this is turning into a rare breed and are considered “at-risk” in Britain. The sheep are quite large and sturdy with very thick, long fleeces. This is the information about Lincoln fiber: 9 inch (23 cm) staple length, pointed tip, 3 crimps per inch (2.5 cm), thick size fiber, the colors are whites and browns. The luster is high. 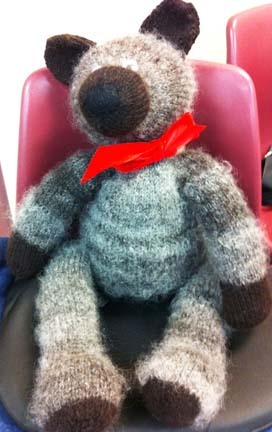 Can be used for knitting into outer garments. We were each given a handful of fiber to spin so we could try out the day’s lesson. 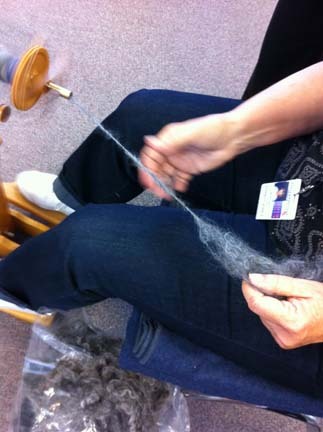 Margaret Tyler, our teacher, demonstrated how to spin “fuzzy” yarn. 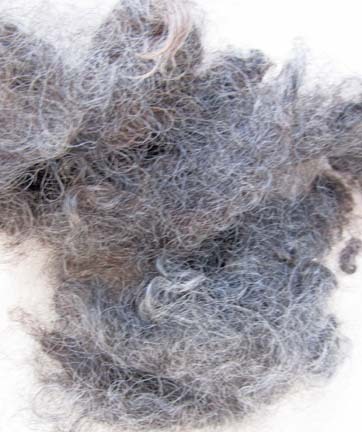 To spin a fuzzy yarn use a short, forward draw with an open hand. You can see how the right hand is blurred as it is opened and closed while drafting. Look how wonderfully fuzzy this yarn is! Magic! She stressed that she does not ever want to hear us refer to any yarn as stiff. She said it’s all in the spinning and variety, using Romney as the example. Anne Field’s book Spinning Wool Beyond The Basics says that Lincoln should be used for outer wear and woven into rugs. Well, after today’s demonstration and seeing how soft this wool is, I’m a believer in not judging wool. 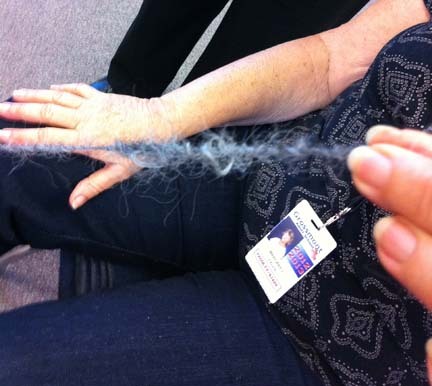 Another student purchased and “fuzzy” spun some Lincoln fiber and shared what she made. All of us fell in love with him and had to give plenty of hugs! This is the SOFTEST yarn. She double plied the yarn. The stripes come from the natural colors in the yarn. If you have some crimpy fiber give it a try, spin fuzzy!